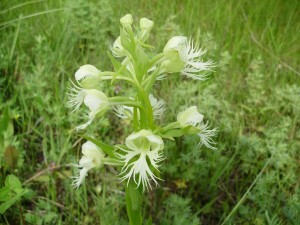 The western prairie fringed orchid (Platanthera praeclara), 7 July 2014 in a roadside ditch near Tolstoi, Manitoba. This site is the only location in Canada where this orchid grows. Photo © T. McGonigle. Brandon University’s Environmental Science Labs (ESL) are state of the art analytical and microscopy suite that supports research and research training in both soil biology and palaeoenvironmental reconstruction. Please note: We are unable to provide testing services for the general public. Click here for info about labs that offer tests to the public. Information is provided on these web pages for information only; for research collaborators, stakeholders, and for recruiting graduate students. Palaeobotanical proxies of climate (‘deep time’ climate change studies). Research facilities and activity in the ESL is funded by the Canada Foundation for Innovation, Manitoba Research and Innovation Fund (province of Manitoba), NSERC, BU Research Committee, and CFB Shilo. The ESL is available on a cost-recovery basis for BU researchers and research students, and other university researchers and their students, by arrangement. The cost of facility use, or customized sample processing, available on application. Please contact the Analytical Laboratory Director Dr. McGonigle for any inquiries about testing your samples. For facilitated publications from this lab, go to Related Links to visit our professors’ home pages.